The Freedom 251 smartphone will official be unveiled by manufacturer Ringing Bells in India shortly, and it seems to be the cheapest smartphone in the whole world. Running Android 5.1, it sounds on paper like a usable phone - it might not impress anyone, but at a price of just Rs. 251, it doesn't exactly need to blow you away in terms of performance. However, there are some points for concern about the phone, as was noticed when we first got our Freedom 21 unit. For starters, the Freedom 251 unit we received bears the logo of Adcom, which has been covered with a sticker. Adcom is a Delhi-based importer of IT products that deals in smartphones and tablets. At first glance, the Freedom 251 appears similar to the Adcom Ikon 4 and has reasonably similar specifications as well. The Adcom Ikon 4 has also got a similar design, and has a 4-inch display, Android 5.1, a 1.3GHz quad-core processor, 5-megapixel rear camera, and 1.3-megapixel front camera, with 8GB of storage, and 1GB of RAM. 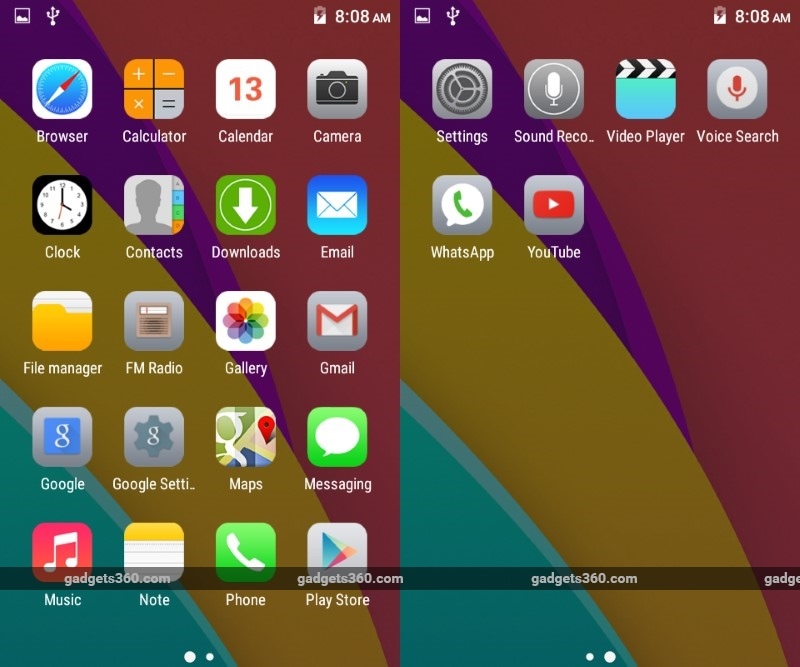 What's more, the UI of the Freedom 251 has been customised to look a lot like an iPhone. In fact, many of the icons look identical to apps that ship with Apple's phone, which makes us wonder if it will attract some attentions from lawyers at Cupertino. That's not the only cause for concern though. All phones sold in India must be certified by the Bureau of Indian Standards (BIS). Getting this certification done is both time consuming and expensive. However, it appears that the BIS registration of the Ringing Bells Freedom 251 has not been done, as it is not listed in the list of manufacturers registered by BIS. This means that if the phone is a new device made by Ringing Bells, then it has not been certified as safe for use in India. What this means is that the Adcom A400, or at least some variant thereof, could well be the origin of the Freedom 251. That phone was made two years ago, and if old stock were to be repurposed, it would explain the relatively low cost of the phones. It still sounds like a great deal at Rs. 251, though perhaps less of a Make in India accomplishment than it is being made out to be. Gadgets 360 wrote to a Ringing Bells representative asking about concerns raised in this article, and we received a mail that stating "all answers will be given on stage in the presence of the ministers". Let's hope we get answers to our questions about Freedom 251 shortly.